Audi has pulled the wraps off this striking E-tron Sportback concept at the Shanghai motor show. The concept previews Audi’s second series-production electric model, due in 2019. Audi said its sleek new EV is aimed squarely at Jaguar’s forthcoming electric SUV, the I-Pace. The E-tron Sportback shares its powertrain with the 2015 E-tron quattro concept, which previewed Audi’s first production EV, due in 2018. Audi’s latest concept mixes the lines of a liftback with the stance of an four-seat SUV. It creates what the brand describes as “a new class of car” that will attract buyers who may have previously considered an A7 but want a more commanding view of the road. The car’s electric drivetrain negates the necessity for a conventional front grille through which air can flow, but Audi has applied its familiar design language to the front end of the car. However, there is a new ‘bridge’, formed by one vent at the top of the grille and another at the front of the bonnet, through which air can be channeled. The E-tron Sportback sits on 23in alloy wheels. The car uses what Audi describes as “next-generation digital lighting technology” to enable the use of matrix LED full-beam head lights. It also introduces new daytime running lights that project their light onto reflective sections of bodywork, instead of directly outwards, and also double up as scrolling indicators. They’re accompanied by matrix laser lights located under the front and rear bumpers that project turn signals onto the road. The e-tron Sportback has two motors that power the rear wheels and one that powers the fronts, with the drivetrain producing maximum combined outputs of 496bhp and 590lb ft. This enables a 0-62mph time of 4.5sec and a restricted top speed of 131mph. In most driving conditions, just the front motor is used, with the two rear units adding torque in high-load or low-grip conditions. The drivetrain can be switched to permanent all-wheel drive should the driver need it, and the rear axle shuffles power between the wheels via torque vectoring. The concept car uses 95kWh batteries that can be charged wirelessly using an AC home charger or a DC fast charger. The fast-charging method currently peaks at 50kWh, but by the time the E-tron Sportback reaches production, 150kWh will be possible. That will allow the car to charge its batteries to 80% of capacity in just 30min. The driving range from fully charged batteries is expected to exceed 311 miles. The battery pack is located low in the car’s structure and the overall weight distribution is 52/48 front/rear. The car weighs just over 2000kg and makes use of carbonfibre and aluminium in its structure (which is based around the MLB platform) to keep the weight as low as possible. The E-tron Sportback’s length and wheelbase are almost identical to an A7’s, but it’s wider and stands 1.53m tall — which is 110mm taller than the A7 — to offer more cabin space. Audi has previewed the E-tron Sportback at the Geneva motor show, debuting a heavily camouflaged prototype ahead of an official unveiling. The orange liveried car was on display at a media event on the eve of the show, giving us our closest look yet at the coupé-inspired electric SUV, which is expected to go on sale before the end of the year. The Sportback is understood to share its platform and powertrain with the E-tron quattro SUV, only with sportier styling to help it challenge the likes of Jaguar's I-Pace. The camouflaged prototype was recently seen near an Audi test centre, sporting a more traditional front grille design than the Sportback concept that made its debut at 2017's Shanghai motor show. It does, however, retain digital rear-view cameras in place of traditional door mirrors, as seen on the E-tron quattro as an option. The E-tron Sportback appears to use the same kind of rear LED brake light bar first introduced on the A8 limousine and which is quickly becoming a staple of premium Audi models. With the majority of the car still disguised, it's uncertain how close to the concept the production version will stay, but the overall shape appears to be true to the original vision. The concept mixes the lines of a liftback with the stance of a four-seat SUV to create what the brand describes as “a new class of car” that will attract buyers who might have previously considered an A7 Sportback but want a more commanding view of the road. The E-tron Sportback concept sits on 23in alloy wheels. The car’s electric powertrain negates the necessity for a conventional front grille through which air can flow, but Audi has applied its familiar design language to the front end of the car. However, there is a new ‘bridge’, formed by one vent at the top of the grille and another at the front of the bonnet, through which air can be channelled. The car uses what Audi describes as “next-generation digital lighting technology” to enable the use of matrix LED full-beam head lights. It also introduces new daytime running lights that project their light onto reflective sections of bodywork, instead of directly outwards, and also double up as scrolling indicators. They’re accompanied by matrix laser lights located under the front and rear bumpers that project turn signals onto the road. 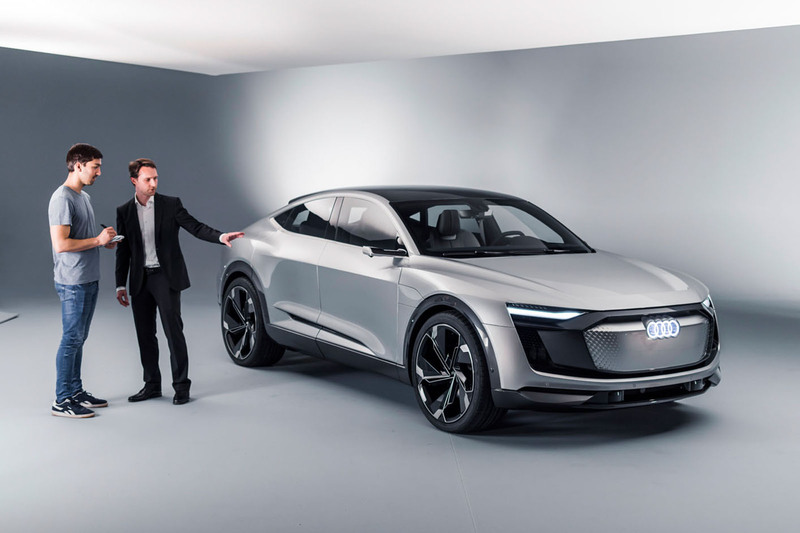 The E-tron Sportback concept has two motors that power the rear wheels and one that powers the fronts, with the powertrain producing maximum combined outputs of 496bhp and 590lb ft. This enables a 0-62mph time of 4.5sec and a restricted top speed of 131mph. The production version of the E-tron quattro produces 402bhp and 487lb ft in Boost mode, where it achieves 0-60mph in 5.5sec. The E-tron Sportback is likely to have similar performance. In most driving conditions, the concept uses only the front motors, with the two rear units adding torque in high-load or low-grip conditions. The powertrain can be switched to permanent four-wheel drive should the driver need it, and the rear axle shuffles power between the wheels via torque vectoring. All three motors can recover energy during braking and coasting, and the intensity of energy recovery is adjustable through four levels. The concept car has a 95kWh battery pack that can be charged wirelessly using an AC home charger or a DC rapid charger. The rapid charging method currently peaks at 50kW, but by the time the E-tron Sportback reaches production, 150kW will be possible. That will allow the car to charge its batteries to 80% of capacity in just 30 minutes. The driving range from fully charged batteries is expected to exceed 311 miles. The battery pack is located low in the car’s structure and the overall weight distribution is 52/48% front/rear. The concept weighs just over 2000kg and makes use of carbonfibre and aluminium in its structure (which is based around the MLB platform) to keep the weight as low as possible. The E-tron Sportback’s length and wheelbase are almost identical to the A7’s, but it’s wider and stands 1.53m tall – which is 110mm taller than the A7 – to offer more cabin space. 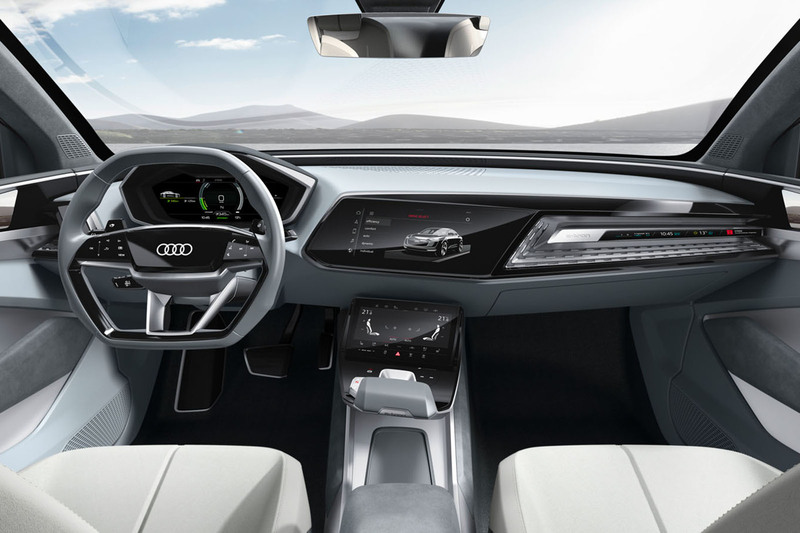 Inside, Audi has evolved its Virtual Cockpit dashboard with touch-sensitive surfaces and a wider wraparound design. There’s a digital instrument cluster, two touchscreens with haptic feedback in the centre console, and a slim digital display in front of the passenger. The car uses cameras in place of rear-view mirrors, with the accompanying displays integrated into the inner surface of the front doors. Driver assist programmes are identical to those featured on the flagship A8, including piloted drive and piloted park, but Audi says the technology on the production car will be even more advanced. Several variants will be produced with differing power outputs from the motors. Given the E-tron Sportback’s complex technical features, and the E-tron's £71,000 launch price, the SUV-coupé could start at around £75,000. What are the advantages of using the three-motor arrangement? How have you ensured that the car’s electric powertrain can deliver fun? The car’s four-wheel drive system is reactive. When will we see a proactive one? Will we see an hot version? This is the 3rd VW EV press release, for cars that won't even be around for years to come. Autocar, or should I say VWAutoCar, ENOUGH! VW and their friends in the automotive media are doing a good job in spinning all these far off concepts as a way of forgetting dieselgate and presenting the group as forward looking. Presenting three very similar ones in one day seems excessive though. Until something is in production its all hot air and fluff, expecting Autocar to show critical integrity and to call it as such would be a futile task though! And why do they have to always put their concept cars on those silly tonka toy wheels – perchance something to do with the current generation of car designer's childhood? No amount of pro-active, reactive torque, hypoallergenic vectoring the world is going to prevent them from destroying your teeth. Well i had my reservations about Lichte (sp) and his new styling direction for Audi after seeing the awful Q2. However I'm liking this and the Q8. It's definitely got presence. Yup.. VAG EV 'line-up' that exists only on a MAC hard drive. Another day another VW electric car story in our dearly beloved Autocar. Oh wait it's the second or is it third. Does the opinion piece count? At this rate Autocar will soon have to change its name to e-VW-car! Calm down it is still two years away at least. Perhaps this is how you build up for a genuine 5 star car. Just as good as my "genuine" leather shoes which I'm thinking about passing to one of my vegan friends. Not as pretty as the Jag. This is just a A7 on stilts, lacks the purity and modernity of the I-Pace. Audi Cars are generally amongst the ugliest utilitarian boxes on the road but they have outdone themselves with this one. There was me thinking that it would be hard, nigh on impossible, to make a car uglier than a Q2 and here it is. truly awful.